I hate to be the bearer of bad tidings, but we, meaning we the nation, have already fallen off the proverbial fiscal cliff. We are like Wiley Coyote who, standing in midair about 10 feet away from the edge of the cliff, finds out the hard way that the law of gravity is stronger than the law of suspended animation. The ears droop, the eyes sadden, and down he goes, spread eagle, so his outline in the ground below will be recognizable. Of course, to some of you this is no surprise. Those of us who have had some training in or experience with economics and finance, and who have been following the mischief created by the executive and legislative branches of government over the years, have witnessed the gross mismanagement of the nation’s fiscal and monetary systems. And it is getting worse. But the federal government’s total unfunded obligations actually add up to something north of $200 trillion when things like veterans benefits, federal pensions, projected deficits, and various welfare programs are added in. 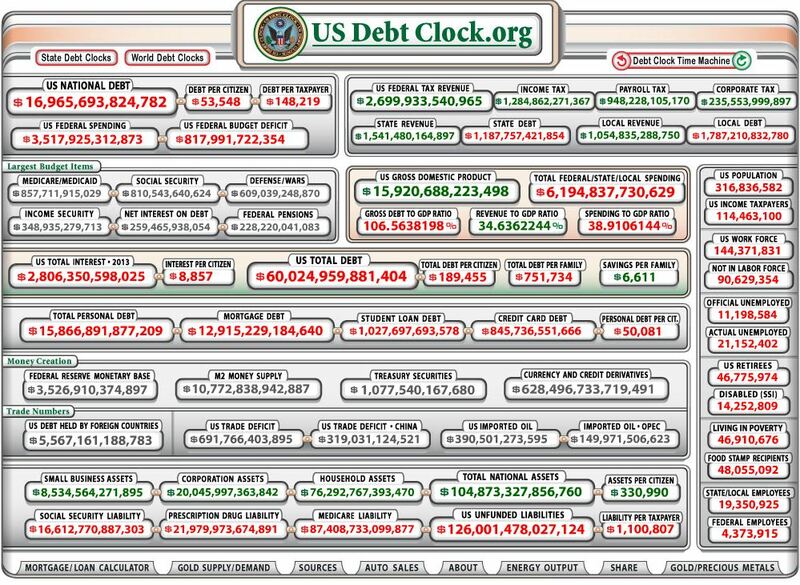 In that light, our current $17+ trillion national debt is only about 8.5% of the total problem. So how did this happen? I think it’s because the electorate has selective hearing. Political candidates always promise to help the rich and the poor, the elderly and the sick, the managers and the workers, the soldiers and the students, the pork-barrel projects and the lobbyists.. Those elected then put the promises through the sausage grinder in Congress and make them into law, or let them fall by the wayside as the case may be. But each constituent group cares only about it’s particular issue and is unaware of or indifferent to the demands of the other factions. It’s when all the affected groups get their own piece of the pie that the promises and the associated financial commitments start adding up. And regardless of whether promises are kept or not, office holders are almost always assured of tenure, just so they can continue to fight the good fight. In fact, during the 2012 election, 90% of House Members and 91% of Senators who sought re-election won. Yet the approval rating for Congress averaged 15% for 2012. More interesting, however, is a Gallup poll earlier this year, which found that 62% of voters approved of the job their particular representative was doing, but only 35% could name him or her. Clearly, we have lost the most important mechanism for keeping our representative democracy in check. And that’s a real insult to our founding fathers. And a real danger for the health of our nation, financially and otherwise. Congress’s approval rating is now as low as 5%. Yet this once respected cornerstone of our democracy is now consumed with a pathological obsession for a single issue that holds the entire nation hostage, posits an extreme political ideology that threatens our national security, and turned the blame-game into an art form. Meanwhile, the unfunded promises made by Congress over the years continue to accumulate. Yet there are ways to mitigate these financial crises, albeit with some pain for all. But that would take the will of Congress and a commitment by the members to look beyond the next election and into America’s future. Will Rogers famously said, “When you find yourself in a hole, quit digging!” But Congress keeps digging anyway. They know the average voter can’t tell an unfunded obligation from a continuing resolution. Besides, when you’re talking about trillions of dollars, most people don’t know what that really means anyway. There is a real possibility that, at some point, the lights will go out in the Shining City on the Hill and Congress will then realize it has to stop digging and start being responsible to all the people. Hopefully by then it won’t be too late.